Dr Neck graduated from Murdoch University in 1992 and has worked in a veritable plethora of practices since then. He has been at Cottesloe Animal Hospital since 1996 (and now owns the practice), and has completed membership examinations in Small Animal Surgery, Radiology, and Anaesthesia and Critical Care. David is currently President of the WA Division of the Australian Veterinary Association and the AVA Nominee to the Veterinary Surgeon's Board of WA. He is also involved with the AVA New Graduate Mentor Program, and sits on the Schools Animal Ethics Committee and the Murdoch Veterinary Trust. Dr Jerry Murray, DVM practices at the Animal Clinic of Farmers Branch in Dallas, Texas, USA. He is a frequent contributer to Ferrets magazine, Ferrets USA magazine, and the online Ferret Health List. He has also written ferret related articles for several veterinary magazines. As a pioneer in the treatment of endocrine issues in ferrets, he has lots of experience dealing with adrenal gland disease and insulinomas. In 2005, Dr Murray was presented with a Special Achievements Award for his outstanding contribution to the ferret community. 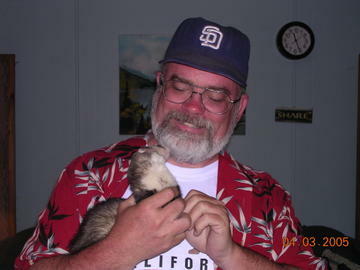 He is a former ferret breeder and has been working with pet ferrets for the past 17 years. He currently has 3 pet ferrets. His hobbies include traveling, wildlife photography, and working with the endangered black-footed ferrets. Dr Bonning and her husband, Jim Greenwood, have shared ownership of the Canterbury Veterinary Clinic in Surrey Hills, Vic since 1987. Over the years Dr Bonning has seen an increase in the number of ferret patients, which has led to a love and increased knowledge of these fascinating little animals. Although Dr Lewington is not giving a presentation at this Symposium, he will be joining the vet panel for the Questions and Answers session. Dr Lewington emigrated to Perth in 1971 and worked as a vet in the northern suburbs during their development and started an interest in ferrets in 1974. Keeping and breeding ferrets lead to contact with ‘ferret’ vets in the USA. He began writing about his way with ferrets in the Sydney University ‘Control & Therapy’ series resulting in a booklet ‘Ferret: A Compendium’ in 1988. In the early 80’s he was one of the founder members of the WAFFS, meeting for some time monthly at AVA House, Perth, and produced a type-written bimonthly newsletter. He joined the American Ferret Association and the World Ferret Union. The production of ‘Ferret Husbandry, Medicine and Surgery’ (FHMS) in 2000 was followed by his retirement from practice but he still continued his interest in ferrets. He wrote a few articles to ferret newsletters and in 2007 the second edition of FHMS, with more overseas contributions than in the first edition, was published. He lives with his wife Margaret, Botanist and essential FHMS manuscript editor, in Wanneroo, W A.